Ideal for the 7mm (O Gauge) modeller or the 4mm modeller who has the space for full scale trees! 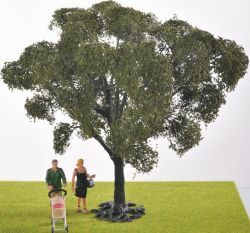 The extra picture(s) are taken showing how these trees could work with your 1:35 scale models. Hawthorn is one of the most common species of tree found in hedgerows and woodland throughout Britain. Crataegus monogyna, known as common hawthorn or single-seeded hawthorn, is a species of hawthorn native to Europe, northwest Africa and western Asia. It has been introduced in many other parts of the world where it is an invasive weed. Other common names include may, mayblossom, maythorn, quickthorn, whitethorn, motherdie, and haw. The weight of this tree is exaggerated to allow for overseas shipping costs.